Julia Langley (far right) with members of the Georgetown Lombardi Arts & Humanities program. 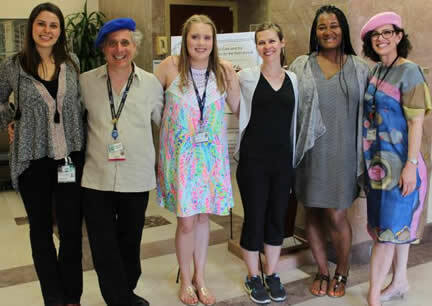 (June 15, 2018) — As Carl Powell Jr. tapped out a quick beat on a djembe drum, Julia Langley, faculty director of the Georgetown Lombardi Arts & Humanities program, welcomed members of the Georgetown Lombardi community to the third annual Poetry Cafe in the chapel at MedStar Georgetown University Hospital. While converting a chapel into a coffeehouse may seem like an unusual practice, the intersection of spirituality and the arts goes back centuries. 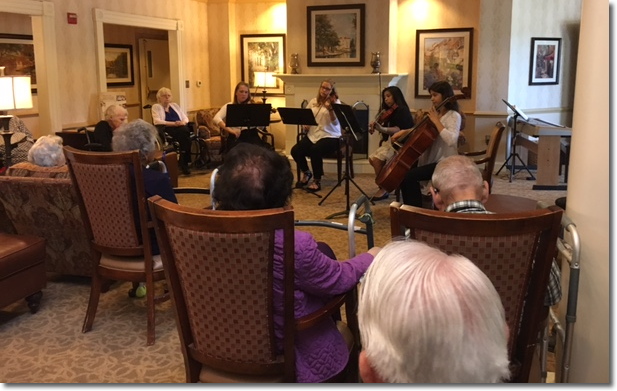 A TCSYO quartet performed for a packed house at Sunrise Assisted Living at Reston Town Center. Sunrise management was impressed and invited the quartet back for a holiday performance. “These young ladies were wonderful and captured the hearts of our residents with their beautiful music.” TCSYO is committed to reaching out to bring the arts to everyone in the community. 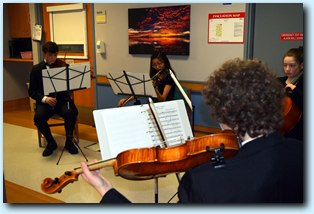 Georgetown University Hospital/Lombardi Comprehensive Cancer Center invited a quartet from TCSYO's Symphonic Orchestra to perform for patients and staff. It was a welcome dose of holiday cheer for those needing it most. 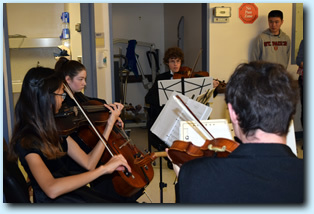 Strains of The First Noel, Mozart's Divertimenti and Adeste Fideles reverberated throughout the hallways and into the rooms, bringing smiles to patients young and old and their visiting families and applause from grateful nurses and doctors. TCSYO salutes Georgetown University Hospital/Lombardi Comprehensive Cancer Center for making music and arts a vital part of the healing process. 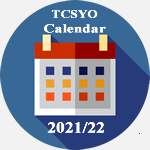 TCSYO is honored to participate in this effort.